Three weeks to go and the debate over the Scottish Referendum gets no better. Reason goes down the drain. The large number of anti-independence people giving their views can do nothing but issue gloom and doom warnings for Scotland’s grim fate if it casts itself adrift from the United Kingdom. The No side, or Better Together as it likes to be called (it was going to change that to “No Thanks” but that seems to have been quietly forgotten) focuses almost entirely on money – sorry – “economy”. It produces some totally inane statements, such as “Pakistan is richer than Scotland”. Do they really think that will persuade the Scots to stay within the UK? In the televised debate between Alex Salmond and ex-UK Chancellor Alastair Darling on 25 August, Darling kept trying to push the debate onto the economy, regardless of what they were debating. There was a lot of angry exchange over whether Scotland could keep the pound and Salmond got Darling to finally admit that nothing, but nothing, can stop Scotland from keeping the pound sterling, should it so wish. But, said Darling, you won’t get an agreement with the rest of the UK about that. “And what is your Plan B?” he demanded. There are well over a hundred nations that have a currency union agreement, replied Salmond. Why should Scotland be denied what so many others have? And, among three Plan B options was this: “let us keep the pound with a currency union agreement, and Scotland will take on its share of the UK national debt, (now standing at over £1.27 trillion). But deny us an agreement over the pound and the debt is all yours.” It seems a pretty generous offer to me. And, as someone in the audience pointed out, Darling (Scottish) and his predecessor, former Chancellor and then Prime Minister Gordon Brown (also Scottish) were responsible for much of that debt. And don’t forget that under the current Prime Minister David Cameron (with Scottish forbears and pretensions) the debt has increased. Scotland could hardly do worse, and may very well do better on its own. There is a constant downplaying and denigration of the Scottish economy by the No campaign. Have they nothing better to say? Not once have I heard, “Please, Scotland, stay with us. We need you. You are a valuable part of the UK and we will be poorer in many ways without you.” All they can do is attack, sneer, belittle and insult. Take the issue of Scotland’s scientists. Scotland’s scientific research would suffer from a loss of funding if there was a Yes vote. In a letter to the Times, the presidents of the Royal Society, British Academy and the Academy of Medical Sciences wrote that “Scotland has long done particularly well through its access to UK research funding.” Scotland, they say, would find it hard to maintain the levels of funding needed. But, they added, “We believe that if separation were to occur, research not only in Scotland but also the rest of the UK would suffer.” Indeed it would. Scottish scientists have long had an enviable world reputation. And really, if Russian and American scientists can work together in the International Space Station, why not researchers either side of the border? As Professor Bryan MacGregor, a spokesman for Academics for Yes, said: “The simple truth is that Scotland does well in open competition for funds but poorly where funds are allocated by other means.” In other words, the funding might be somewhat better under independence. How about this for a scare story? Nobel Prize-winning scientist Sir Paul Nurse, having praised the “wonderfully innovative biomedical teams” working in Scotland, warned that cancer research could be harmed by a yes vote. And doctors would leave, according to a top surgeon at Edinburgh’s Western General Hospital. But why? Unless, perhaps, pay is more important than patients. When the No campaign, so very Westminster -managed, isn’t spreading bad news about the possible loss of financial security, it switches to another kind of “security” – the importance of keeping the Trident missile at its base in Faslane. Actually, it would rather not talk about Trident at all but needs must, as it is an important cornerstone of the Independence campaign. Alastair Darling said removing Trident would mean a loss of 8000 jobs. But, replied Salmond, we plan to keep Faslane as the base for Scottish Defence, with all the jobs that implies. Darling countered with the Royal United Services Institute’s claim that Trident couldn’t be moved until 2028. Salmond came back with the fact that RUSI actually said that setting up all the infrastructure elsewhere for Trident and its submarines would take that long. The removal of Trident could easily be accomplished in the proposed 5½ years. The fact that no one could use it for several more years would be to everyone’s benefit. So where could it go? This is the one post-independence issue that has been discussed south of the border. The answer – the Royal Naval base at Devonport. I think the good citizens of Plymouth and Devon would have something to say about that. So would all the shipping. Devonport is on the pretty narrow English Channel. To have one of the busiest of the world’s shipping lanes trying to cope with nuclear-armed submarines sailing in and out doesn’t bear thinking about. Particularly when one takes into account the Trident fleet’s record for bumping into things. Salmond in this instance is right – the world would be a better place without weapons of mass destruction. Darling asked why, if Salmond was so opposed to nuclear weapons, he was willing for Scotland to seek to join NATO? After all, NATO is a nuclear-armed organisation. It seemed a good question until Salmond kindly pointed out that NATO has 28 members and only three, the US, the UK and France, have nuclear weapons. The debate didn’t go well for Darling. His whole stance, his talking down of the SNP’s plans for life after a Yes vote, spoke of an MP wedded to Westminster, no matter how Scottish his blood. He kept dragging the debate back to money, as though that is all Scotland is about. Yes, Scotland would have to work hard to get a post-independence economy but it could be done. And Salmond threw in a cherry-on-the-cake suggestion. Get Trident out of Faslane, he said, and Scotland could open up the Firth of Clyde for oil and gas exploration. The Scots are going to find it hard to forget the insults. Even more, they are right to question what will happen if they vote No. As one woman said in a radio debate, “There is no certainty as to what will happen to us afterwards if we vote No.” Westminster simply isn’t saying, apart from vague promises of the election-related, easily-forgotten kind. Nor is it making any plans for what it will do if there is a Yes vote. But voters are quite naturally seeking certainty, and sometimes there seems to be a feeling that England will take its revenge for this referendum. England and Westminster have conveniently forgotten just how much money the UK has made over the years from North Sea oil. And we would lose that revenue if Scotland became independent. Salmond may well be depending too heavily on money from the North Sea to fund some of his plans post independence, but whatever his opponents claim, it will still be a valuable source of income. Salmond and the Scottish National Party have made various commitments as to what they would do after a Yes vote, affecting major areas such as the Health Service, Pensions & Social Security and Education. People worry about these aspects of their lives and some efforts have been made to show how Scotland could afford to implement those commitments. Some plans may work and some may not, but for Westminster-based politicians to pooh-pooh the Yes campaign’s proposals when, apart from the wealthy, the whole of the UK is currently suffering from the poor economic reconstructions of the current government is shaming. The polls say the No campaign is leading but the gap is closing. In the first debate between Salmond and Darling, polls said Darling had won. The last debate went to Salmond – decisively. 73% gave him the thumbs up, and he certainly stirred up national pride in the audience. Curiously, although the English, of which I am one, are said to “overwhelmingly” want Scotland to stay in the UK, I have not actually come across anybody holding that opinion, and I live in a very conservative area. Just as the Scots must feel insulted by all the negative and arrogant campaigning against independence, the greater part of it from people who do not live in Scotland and will not vote, I feel embarrassed and angry to be governed by such people. And each time another stupid and insulting reason is given for voting against independence makes more Scots decide to vote Yes, I find myself cheering them on. 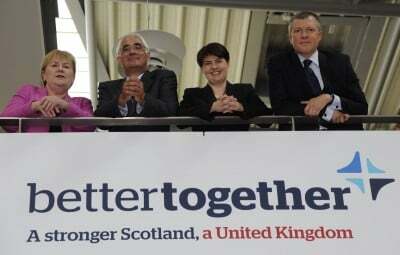 I have honestly tried to be impartial, because this referendum is for Scotland to decide. But the more utter nonsense I hear from Better Together the more I feel Scotland would be Better Apart. I wish I could join them.